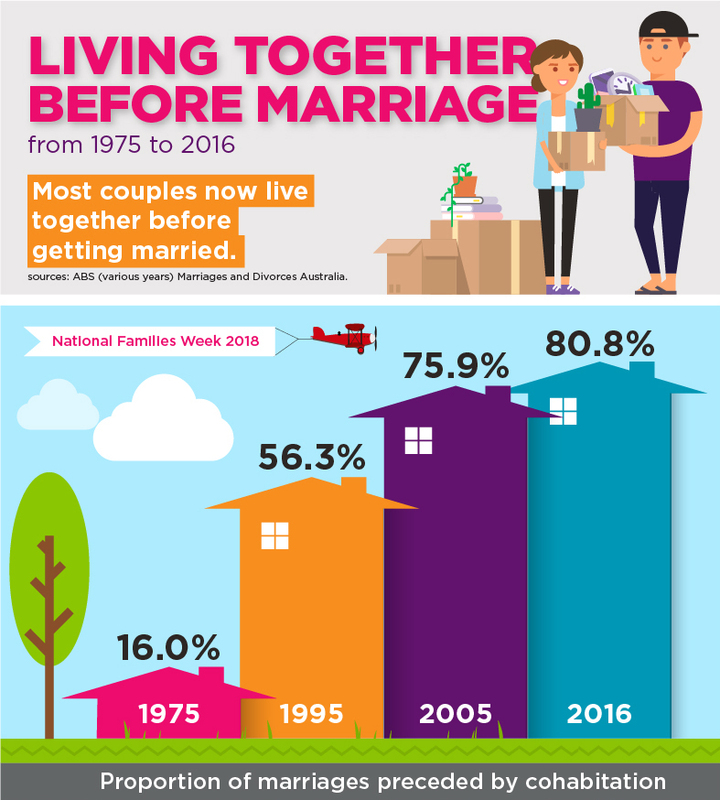 In 1970, there were 9.3 marriages per 1,000 Australian residents: a ‘marriage rate’ of 9.3. 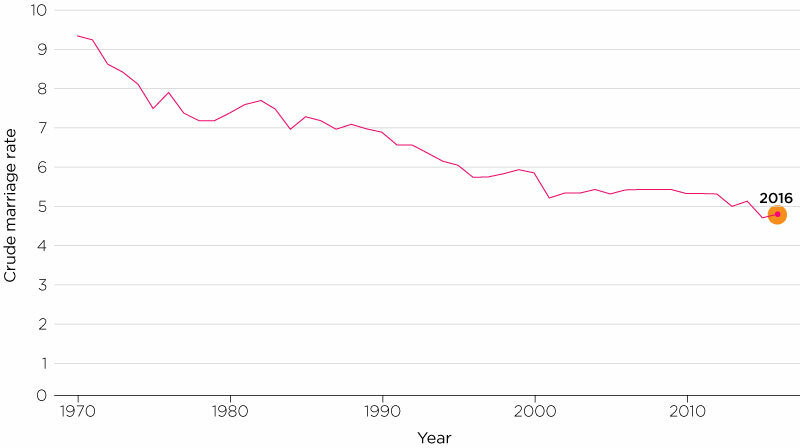 In 2016, the marriage rate had declined to 4.9. Note: Crude marriage rate: Number of marriages per 1,000 of estimated resident population at June for each reference year. How old are we when we marry? Men and women have been waiting longer before getting married for the first time. 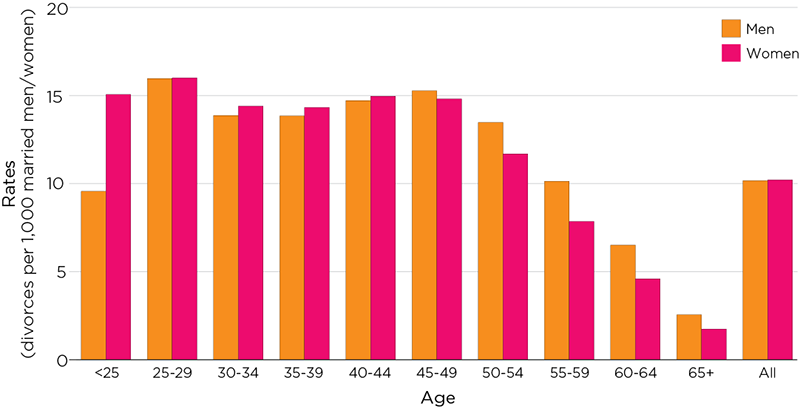 In 1971 the median age for men was 23.4 years, and for women 21.1 years. In 2016, the median age of men was 30.3 years, and women 28.7 years. Most couples now live together before getting married. This has greatly increased since the mid 1970s. In 1975, only 16% of marriages were preceded by cohabitation. By 2016, the proportion was 81%. An increasing number of couples are turning to a civil celebrant to conduct their marriage ceremony. In 1902, almost all marriages (97%) were performed by ministers of religion. 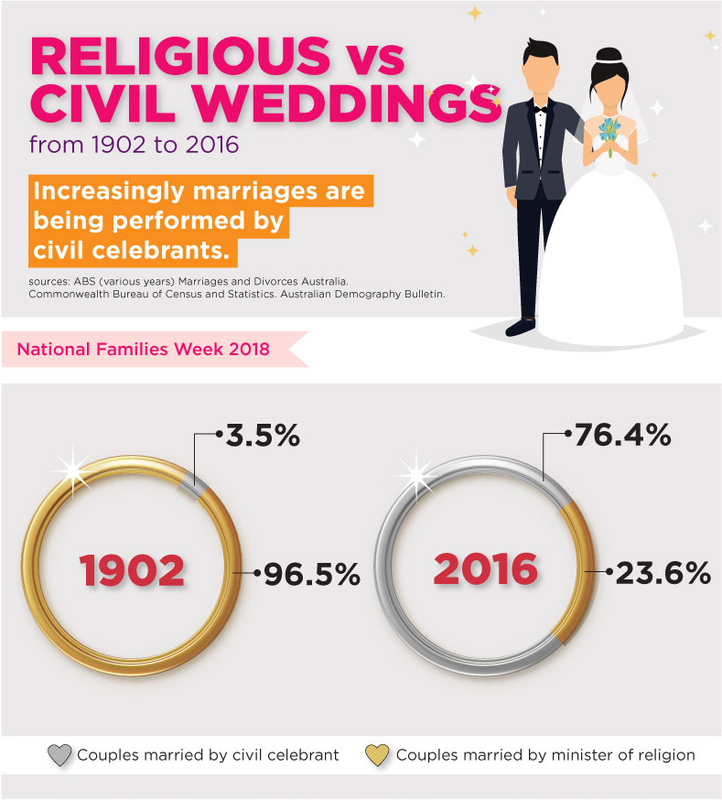 However, by 2000, there were more marriages performed by civil celebrants than by ministers of religion. By 2016, 76% of marriages were performed by civil celebrants. 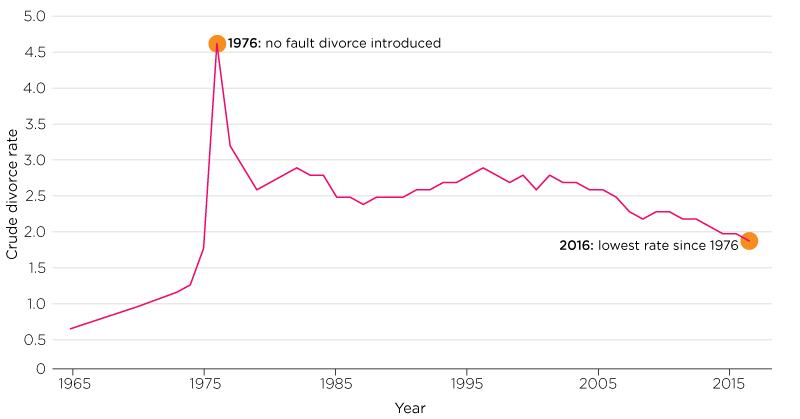 The divorce rate (divorces per 1,000 Australian residents) rose in the 1960s and 1970s and peaked at 4.6 per 1,000 resident population after the introduction of the Family Law Act 1975, which came into operation in January 1976 and allowed no-fault divorce. The divorce rate has fallen in the 2000s. In 2016 it was 1.9, the lowest rate since 1976. At what age are couples divorcing? In 2016, for both men and women, the divorce rate was highest for those aged 25–29 years. After that, divorce rates lower slightly, staying steady for couples during their 30s before a second peak in their later 40s. After age 55, couples are increasingly less likely to divorce. The proportion of divorce involving children under 18 years has fallen from the 1970s, from 68% to 47% in 2016. This could be a reflection of the age couples are divorcing: in their 20s, couples are less likely to have children; and when they are in their late 40s, their children are more likely to have grown up. Leading researchers discuss significant issues affecting Australian families.